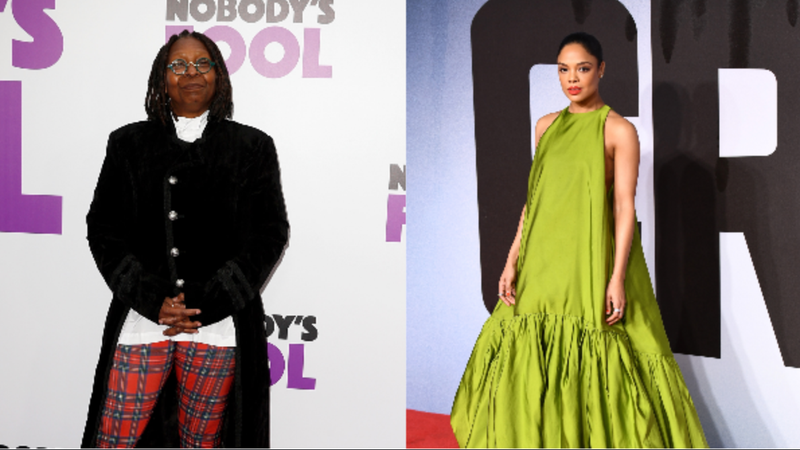 (L-R): Whoopi Goldberg attends ‘Nobody’s Fool’ New York Premiere on October 28, 2018 in New York City. Tessa Thompson attends the European Premiere of ‘Creed II’ on November 28, 2018 in London, England. It’s February, which means the 91st Academy Awards is right around the corner. We may not have a host confirmed (or know for sure if there will even be one, or two, or multiple...), but we now know the first round of presenters! There’s some blackness in the crowd, including Whoopi Goldberg, Tessa Thompson, Amandla Stenberg, and Maya Rudolph. They’ll be joining Awkwafina, Daniel Craig, Chris Evans, Tina Fey, Brie Larson, Jennifer Lopez, Amy Poehler, Charlize Theron, Constance Wu, and Gustavo Dudamel. The Los Angeles Philharmonic will perform during the “In Memoriam” Segment. Also, the fancy-schmancy Oscars luncheon happened on Monday afternoon, and according to Vanity Fair, the Academy members gave the highest rounds of applause to Regina King, Mahershala Ali, and Spike Lee. Academy president John Bailey recently spoke with Deadline about the status of the ceremony, which is “still in flux.” Bailey confirmed it’ll be a mix of tradition and incorporating a significant international impression by securing big stars known around the world. One of the most well-known traditions where the four Best Acting winners (leading and supporting) present their respective awards to the new class is still up in the air. He also noted all Best Song nominees will be performed during the telecast, despite previous reports via sources not confirmed by the Academy that only two of the nominated songs would be performed. For the first time ever, some of the categories will be pre-taped. We’re not sure which categories are on this list, but Deadline posits there will be about four of them. The 91st Academy Awards ceremony will broadcast live on Sunday, February 24 at 5:00 p.m. PT / 8 p.m. ET on ABC. Welp, remember when we said earlier that the host situation is unsure? Well, the mystery is over and it’s a sure thing: there will not be a host for the 91st Academy Awards, The Hollywood Reporter has confirmed.